The Delta Air Lines Boeing 747 came close to a Shuttle America plane on 13 June. THE FEDERAL AVIATION Administration is investigating why two airplanes came too close to each other over New York City last week. 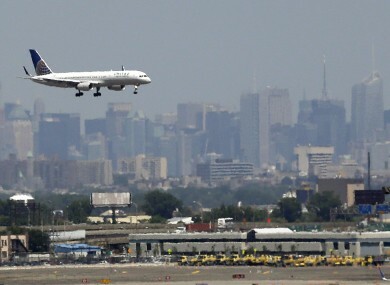 A Delta Air Lines Boeing 747 arriving at John F. Kennedy International Airport came close to a Shuttle America Embraer E170 departing from LaGuardia Airport at around 2.40pm on June 13, the FAA said in a statement today. The planes were about a half-mile apart horizontally and 200 feet vertically, the FAA said. The required separation is 3 miles horizontally or a thousand feet vertically. The FAA said the aircraft were “turning away from each other at the point where they lost the required separation.” Both aircraft landed safely. Delta declined to give details, including the number of passengers on board, pending the FAA investigation. The Shuttle America jet was operating as a Delta Connection flight and is equipped for 69 people. The Delta 747 can hold 376 passengers. Jason Rabinowitz, editor of the aviation news website NYC Aviation, reviewed air traffic control audio and radar tracking data and concluded the pilots and controllers acted professionally in an unusual sets of circumstances brought on by strong winds. “The traffic controllers did a very good job,” he told The Associated Press, noting that traffic is extremely heavy at the two airports. It was handled very well. … They did take immediate action to prevent anything from happening in very unusual circumstances. The close call happened because the Delta jet and an American Airways flight preparing to land on a parallel runway broke off their approaches to JFK almost simultaneously, he said. The American flight was instructed by the control tower to make a right turn and attempt another landing. When the Delta pilot seconds later said he needed to circle, the tower told him to make a left, Rabinowitz said. That left turn put the Delta jet closer to departing traffic from LaGuardia. The Delta pilot then turned right hard, but 747s aren’t “the most nimble aircraft in the sky,” Rabinowitz wrote, and that allowed the Delta and Shuttle America airplanes to wind up too close to each other. Rabinowitz said there was a moment the two aircraft were at nearly the same altitude and headed for each other, but the controllers and both pilots were aware of the conflicting traffic and both jets were turning away from each other. The Delta flight originated in Narita, Japan; the Shuttle America was heading for Jacksonville, Florida. Rabinowitz said he doubted passengers were aware of the situation. Email “Investigation after two planes have 'near miss' over NYC”. Feedback on “Investigation after two planes have 'near miss' over NYC”.